Without even meaning to, I often let messages from our culture dictate my thought processes. And then I encounter a truth or story in God’s Word and discover I have been backward in my thinking about a certain idea or issue. In particular, I have carried some very worldly ideas about ministry these past few years. God has continually shown me how His version of Christian service and calling is very different than mine. I have thought at certain points that ministry is about my efforts for God and that I have been responsible for creating some sort of stage for myself with which to declare His glory (and also look good myself!) — more of the latter if I am honest. There was also a prophet, Anna, the daughter of Penuel, of the tribe of Asher. She was very old; she had lived with her husband seven years after her marriage, and then was a widow until she was eighty-four. She never left the temple but worshiped night and day, fasting and praying. Coming up to them [Jesus and his parents] at that very moment, she gave thanks to God and spoke about the child to all who were looking forward to the redemption of Jerusalem. These few lines tell us so much about a woman who lived an effective life of Christian service. Though she didn’t seek out attention or applause, she still encountered Jesus and was used by Him in a big way. 1. Jesus wants to use us. One major worldly notion I held about ministry a few years ago was that it was about what I had to bring to the table. If the truth be told, although I left teaching four years ago to answer a call to go into music and women’s ministry, I was secretly afraid that I wasn’t qualified enough to serve God. My main concern had to do with poor choices I had made in my past. Even though I knew God forgave people of their sins, I thought that maybe I had stepped too far over the line. After all, I rationalized, it was fine if you sinned in your life before Christianity and then got cleansed of those things upon salvation — but what if you were a big sinner even as a Christian? At the age of 18, I had been in a band and had begun writing music, but I left that to pursue a career in education. The longer that I served as a teacher, the more I began to think that I needed to forget about my dream to be used in music. I figured that I had messed things up too badly in my life for God to allow me to be used in worship again. Therefore, when I felt Him telling me to go down a music path and create a ministry, my natural response was that I thought I needed to hide those ugly blots from my past and not bring them up. Surely, if people knew some of my deeds, they would never listen to anything I had to say. Therefore, it surprised me greatly when God began to prod into those very areas and encouraged me to begin sharing with others about my past and how He was healing me. It never occurred to me that He would be able to use such ugly things and use them as a platform on which to base my ministry. And not only that, I worried that I wasn’t qualified enough in terms of abilities. Like Moses doubted he could be used because of a speech impediment (Exodus 4:10) and Jeremiah doubted he could be used because of his youth (Jeremiah 1:6), I worried that I wasn’t talented or capable enough to be a vocalist or spokesperson for God. However, as we see with Anna in the story, service to God is more about making ourselves available than it is about our impressive skills or qualifications. Although Anna didn’t have a questionable past or insecurities about her ability to be used, she had little status or clout in her society. A woman in her time was not considered as reliable as a man to be a witness in a courtroom — and yet, God entrusted her with the task of serving as a witness to the Messiah to her community. Clearly, we can see that God is not limited by what we think He is. Although He certainly works through our gifts, He is not limited by our individual or society-based perceptions of what we can or can’t offer. As the One who made us, He knows just what we were made for — and the person who can serve Him best is the person who totally relies on Him for His version of who He made him or her to be. 2. God gives us the message and the plan. Another notion I had about ministry that strikes me as being a little funny now is not only did I think I had to be more amazing than I was to really be used, I also held the idea that I had to come up with what I would say and the vision. You see, I didn’t realize that ministry is more about God working through me than it is about what I do for Him. When I first left teaching, I put a lot of pressure on myself to make something happen. I didn’t even know what God specifically wanted to me to do (in and through me) — and I tried to generate a plan before I really knew what His plans were. Yes, I had a vague sense that He wanted to use me in music and later got the memo that He wanted me to start a self-worth ministry, but I tried to get ahead of Him and create the logical steps to make this happen. However, I kept running into roadblocks, and I couldn’t understand why I wasn’t getting anywhere. When I prayed about what to do, God kept giving me odd answers. I felt nudges to contact people from my past. I felt I was to quit the worship team and serve in the nursery. All of the things He was telling me to do seemed to be leading me further and further away from the destiny I felt He had for me. However, it was in these small acts of obedience — these small areas of service that I began to get answers about what I was to do and where it began to dawn on me what God was even calling me to. And it was in these seemingly insignificant places where God revealed Himself to me in ways that astounded me and helped me to know what His purpose for me and the message He wanted me to share was. Similarly, what we can see through Anna’s example is that just as she gave her life to God and didn’t argue with God about the ways He wanted to use her; she understood that God would come up with the plan. She did what she knew to do with quiet, faithful work — and it was in that seemingly insignificant place that she looked up and saw Jesus in bodily form with His parents one day in the temple! And she must have known in that moment what God wanted to accomplish through her. We don’t have to generate the plan or the results. We just have to be faithful where God has placed us — in the thing that might feel so small and unimportant to us. If He has placed us there, and we do not have the green light to move on or see no other open door, we can be content that He has a purpose for us even if it feels to us like we are in the background or no one notices us. And we may look back at a later date and see how that place that felt pointless was the place God used us to bless others, to grow the traits in us that we needed, or to connect us with the individuals He desired us to learn from. 3. God has a specific audience in mind for our message. Just as God has a specific objective He wants to accomplish through you and me in ministry, He also has a specific audience in mind that needs to hear our message. Yes, vast evangelization efforts in a more general sense are needed — the world is starving for what Christians can offer. However, there are specific people (possibly in our immediate realm) who can connect with our specific testimony — and God knows who those people are. In our passage, after Anna encountered Jesus in the temple, she went around and told people that she had seen Jesus in the temple. It says that she shared with people “awaiting the redemption of Jerusalem” (v. 38). The WORD® Translation puts it like this: “She spoke about Jesus to all who were waiting for Jerusalem to be set free.” Although not much explanation is given here, just as Anna was most likely awaiting Jesus’ arrival long before He showed up in the temple, there were others also hungry and searching for Him — needing the hope and freedom He would bring. Not only did God orchestrate a miraculous moment for Anna in the temple when she saw Jesus in person with His parents, He had people within her community that needed to hear about the experience that impacted her so greatly — and had apparently worked in the hearts of her audience before she even knew what her message would be! Anna’s encounter with Christ intersected at the perfect moment when others needed to know how they, too, could intersect with Him. Similarly, God has had a particular group in mind for me to speak to. Just as I didn’t know really what God wanted from me originally when He nudged me to leave my career and didn’t know what my message would be, I haven’t known whom I was supposed to deliver this message to. I thought originally that I would work with high school age girls — perhaps start a ministry at this level because I had been a high school teacher and had experience with this age group. But over and over, when I asked Him whom He wanted me to speak to or serve, I kept recalling the morning I had woken up and gotten the revelation I was to start a self-worth ministry — and God had used the word “women” in His message to me. And this thought terrified me! As an instructor, I felt very comfortable speaking in front of adolescents, but not adults. Whenever I had to speak at a faculty meeting or give a presentation for an adult learning class, I got very nervous. But I’ve aimed my entire blog ministry towards women because God told me to. Therefore, just as God has an objective for us concerning our message and mission when we answer His call — whether that be into an actual pastoral or care ministry or ministry in a different setting — He also will most likely burden us with a desire to reach out to a particular group of people. And as we walk in obedience in what He asks us to do, we will naturally get a revelation about who those people are or encounter them in our daily doings. Does this mean that we won’t ever be prompted to speak to someone outside of our “target” group? No, I don’t believe so at all. Quite frankly, I believe Jesus will orchestrate events in such a way that we naturally encounter all kinds of people in our ordinary happenings that need to hear our story or need us to show Jesus’ love to them. However, I believe that we will be amazed at how when we allow Him to have access to all of us, He will show us how our personal story can impact others not in a broad, impersonal sense but with individuals in a more focused sense — with individuals who have had certain experiences that parallel ours and who can benefit from hearing how God has healed us or is working in our lives. As I survey the list, I realize that God has had to change my ideas of ministry completely and continues to do so. I have been worried at every turn about which way to go, what I will say, whom I will speak to, and how I will accomplish what He has asked of me. And my anxiety has been in vain. He has directed me in all of these areas. He knew these things before I even knew I was to leave teaching! 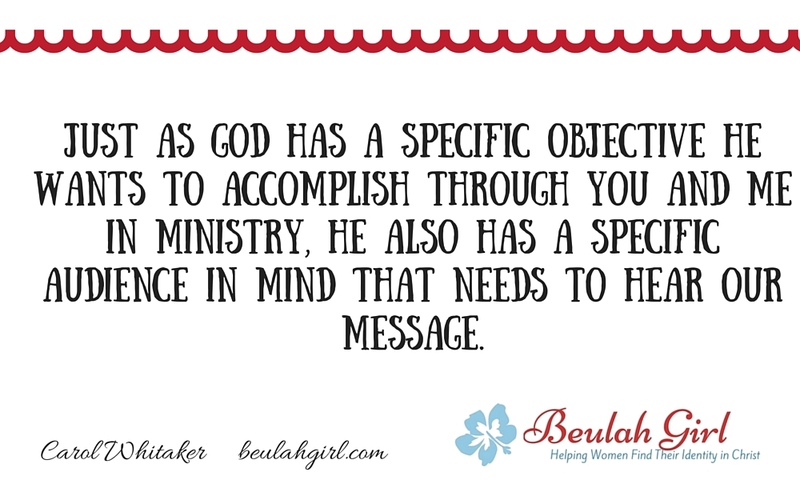 While I have believed that I needed certain qualifications, certain contacts, certain skill sets (and I am not diminishing the importance of any of those things), the thing I have needed most in my ministry venture is God. And the thing He has required of me hasn’t been all the impressive talent(s) I can offer but my surrender to let Him use me as He will. Therefore, to best know the way, we need to put ourselves in a position of surrender. Like Anna, when we give ourselves over to a life of diligent devotion to Him, doing what we know to do now, we can trust that God will reveal His purpose for us when we put ourselves in a place of total trust and reliance on Him.